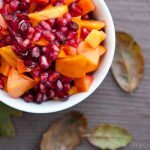 This clean eating winter harvest fruit salad is perfect for dessert during the week or even on your holiday table! 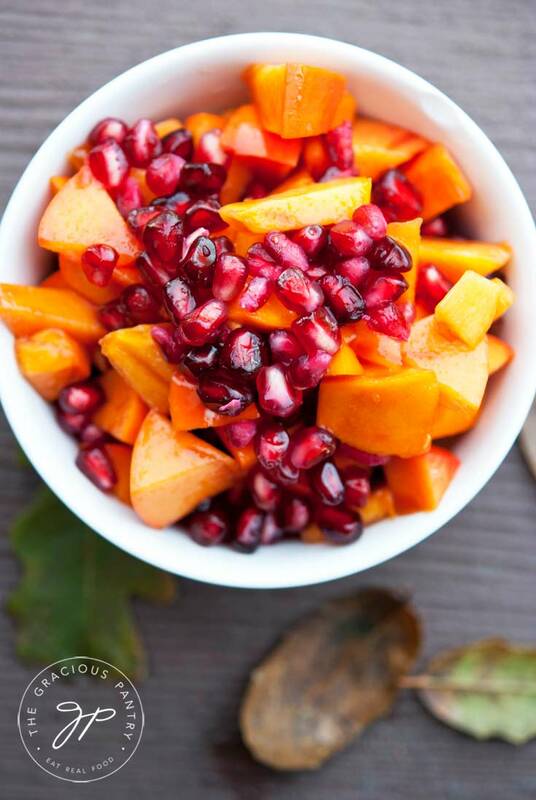 Persimmons and pomegranates were simply born to be eaten together. They are a pairing like no other and every year I look forward to making this salad. It’s truly an explosion of sweet deliciousness. The tart sweetness from the pomegranate really plays up the milder flavors of the persimmons. If your fruit is very sweet and ripe, the lemon juice adds a fantastic accent to this salad. But if they are less sweet, it’s probably best to leave it out. Use your judgement here. Either way, this simple combination of flavors will not be a disappointment. Please know that this salad must be eaten shortly after it is made. It will not last overnight, even in the fridge. The persimmons brown very quickly. So if you don’t think you can eat all of this, cut the recipe in half or even quarter it. Adjust it to how much you think you can eat the same day. Enjoy! HOW TO DE-SEED A POMEGRANATE IN UNDER A MINUTE!! A delicious winter fruit salad that works for dessert either during the week or at your holiday table! Combine all ingredients in a mixing bowl. Mix well and serve. I’ve never had a persimmon before. Can you describe the taste? Does the taste related/remind you of something more familiar? They are very mild in flavor, but also very sweet if properly ripe. I don’t really have a comparison for you, I’m sorry. AHHH… yes. Thanks for THAT! Thanks SOOOOOOOOOOO much for this! I love pomegranates but hate to get the seeds out. This is AWESOME! This salad looks amazing…can’t wait to try! Never had persimmons, excited to try. How odd! You have to hit it pretty hard, and yes, the spoon should be heavy. Sorry it didn’t work for you! Glad you liked it! No, you don’t want to eat the skin or the white membrane inside. Delicious! Definitely needed the fresh lemon juice for that extra kick! How long do Pomegranates keep for? I think between the avocado pesto alfredo and this winter harvest fruit salad, I now have dinner! Brooke – Depends. Are you talking about a whole fruit with the peel in tact or the fresh seeds? Shanna – Wonderful! I hope you enjoy it as well! does it matter which kind of persimmon you use? I know there are 2 different kinds, but until recently had trouble finding them, so don’t know much about the differences between them. Adding this to my menu! The video is helpful and the ending is so adorable! Love it! Jessica – Thanks so much! 😀 I hope you enjoy the salad! How many persimmons and pomegranates did you have to buy to make this?